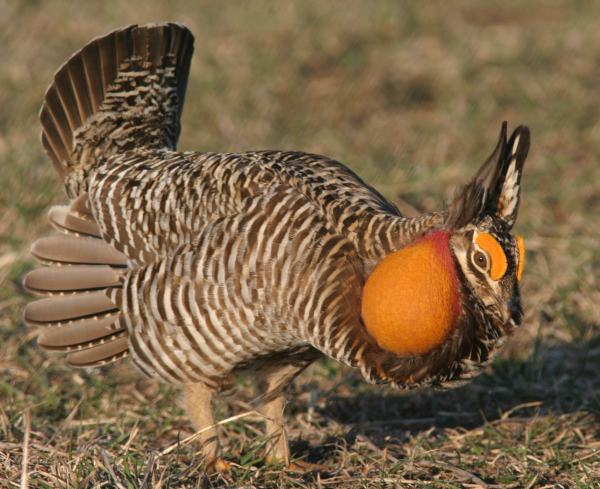 A portrait of an excited Greater Prairie Chicken features an upright stance, raised crest and tail, slightly spread wings, accents of orange skin, and the reflection of the morning sun in its eye. There are few behavioral displays in nature that compare to a dozen grouse in action on a cool spring morning on a prairie landscape. Whether it’s classic Greater Prairie Chicken booming, the excited dancing of Sharp-tailed Grouse, or the other-worldly sights and sounds of gallant Sage Grouse, spring mating behavior on a prairie grouse lek ranks among nature’s great spectacles. For birders, it ranks among the primary rights of spring; and for birders with a camera, it’s nirvana for an hour or two. It’s the best possible opportunity to photograph action photos of birds engaged in activities wrapped in millennia of innate behavior. The first big step is to find a grouse lek; or to utilize a location already set up for observing and photographing grouse displaying on a lek. During most lek photo opportunities I have been able to utilize a semi-permanent blind – a framed plywood box large enough for three to five people and almost tall enough to stand in, with chairs or benches to sit on (bring a cushion), and port holes to stick your camera lens out of. Some landowners offer such a blind set-up at a lek as a “birding tourism” option. Some state wildlife departments also provide such photo blinds, as do personnel at select national wildlife refuges. The blind is positioned where the grass on the lek has been close-cropped, and with the rising sun at your back. You want to arrive before first light; in the blind, be quiet and move as little as possible. Some grouse begin flying into the lek before it gets light; others follow by sunrise. The grouse have their compact territories within the lek mentally staked out, and neighboring males are constantly interacting to reaffirm territory boundaries. That’s where the fun happens. The innate “booming” or “dancing” displays are fantastic to witness, and they are rewarding to photograph. It’s nature at its purest and most intense as a pretext to mating. Any time spent at a prairie grouse lek will provide a lot of opportunities to photograph the actions of individual birds and interactions between birds – males and females. When a female arrives, all the boys go into high excitement mode! They begin performing en masse and the sound is other-worldly. The female eventually makes her way to the center of the lek, where the biggest, strongest, best-looking males have their preferred territories. As she makes her way to the middle of it all, each male grouse offers its best dance and voice – that’s when it gets really wild and action-packed. 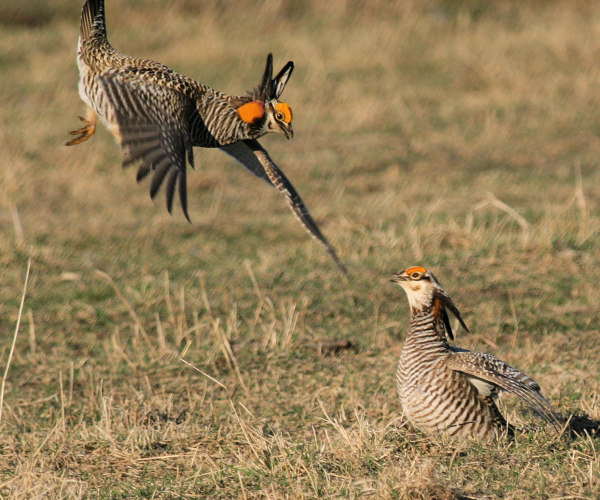 The action of a booming prairie chicken in peak display is the ultimate photo of this prairie grouse species. As for photographing from the blind, you will still need a telephoto or zoom lens and, as always, the aperture and shutter speed you choose are key points that tend to work against one another, depending on light conditions. Starting with aperture, which dictates the depth of field of any photo, when photographing a single grouse, a minimum of depth of field may work best, say an f6 to f8. A limited depth of field will blur the background and help to emphasize your subject. If you are photographing two grouse facing off, it may be best to try a wider depth of field, say an f10 up to an f14 – if the amount of sunlight available permits it. When trying to stop action, you need the fastest shutter speed possible under given f-stop values. It’s best to concentrate on a fast shutter speed to begin with. However, after you’ve taken ample photos, if you have some extra time while you’re in the blind, you should try to purposely take some photographs using a series of slower shutter speeds, and even some really slow shutter speeds, to see what kinds of “action” photos might result. Sometimes, some blurred action can create really interesting images. 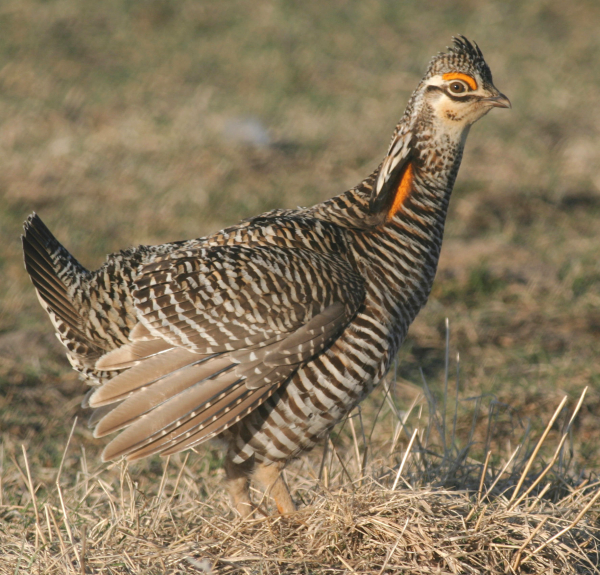 As the April sun warms the prairie landscapes of America, it’s prime time to visit a grouse lek, camera in hand, and enjoy one of the most exciting bird behaviors of spring. Actually, it’s been a while since I have photographed Sharp-tailed Grouse displaying on lek, so as I write this, I’m planning my April visit. As for Sage Grouse, they are the ultimate sage-prairie birds, and I look forward to an opportunity to photograph them in the near future – in Wyoming, or Montana, or Idaho, eastern Oregon, even east-central California – one of those states sometime soon will yield the ultimate Sage Grouse experience. An action photo, whether sharp or blurred, adds appreciably to any photo series. How about you? If you’re not near a grassland grouse haunt, give one of the forest or mountain grouse a try – plan to photograph a displaying Ruffed Grouse, or a Spruce Grouse, Sooty Grouse, or Dusky Grouse. These attractive birds offer exciting photo opportunities too, although they tend to be a single male in action rather than a lek filled with booming, dancing, displaying prairie grouse.